I’ve not been doing a lot of sewing lately…Back in December I fried the screen on my HQ16 and took it in over the christmas holidays.. well i dint get it back till almost the mid February… the screen had to be made from scratch as there are no longer parts for my machine… I lost my ompf. Upon playing some more i decided to change our the starts for flowers… Here’s the version im going to go with.. Its cheery and i know mom will love it. 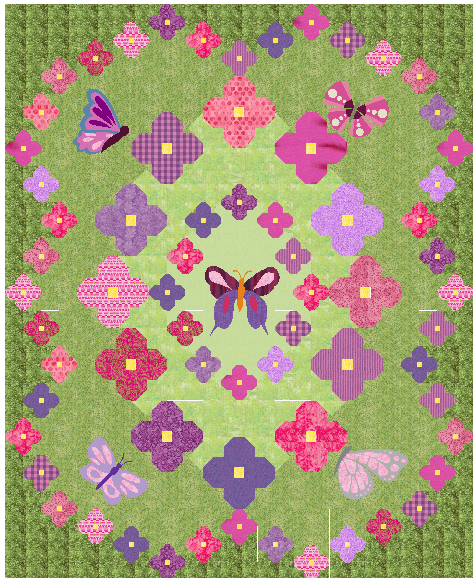 I also added butterflies to the large open spaces. I’m really debating on using minky or fireside or maybe silk batting to keep this quilt light. I will update you all when I have it finished this is my project for the April 5 weekend retreat ill be attending.